Life isn't easy when your big sister is an annoying cat and your moms can't understand a word you say. But that doesn't stop Rumplepimple from saving the day in a most unusual way. Find out how a car ride transforms a naughty terrier into a grocery store hero. 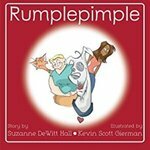 Hall, Suzanne DeWitt, "Rumplepimple" (2015). DIVerse Families. 182.